Our client Coalfire, a leading independent IT Governance, Risk and Compliance firm, wanted a way to stand out at the trade shows where they exhibit while capitalizing on their name. They asked for a creative new idea. Playing off their name—at least the “fire” part of it— we suggested giving away jars of private-label salsa and also serving chips and salsa to the show’s attendees (always good to have food at one’s booth). Drawing on our experience in consumer packaging design, we developed a custom label for “Coalfire Premium Salsa” with the tagline, Independence Never Tasted So Good. We then worked with a local small-batch salsa maker, Rocky Mountain Salsa, to capitalize on Coalfire’s Colorado connection. 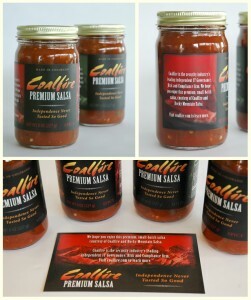 Coalfire was able to share two versions of the salsa—mild and spicy—with visitors at a recent trade show and also had the jars on display in their booth. In addition, visitors to the booth could request a free jar of salsa to be sent to them back home by texting a request to special phone number or using a QR code to reach a special salsa-themed landing page that enabled Coalfire to capture some visitor data for later follow-up. There were a lot of moving parts to this one, and thanks to Kate’s expert project management and Madison’s design work, we were able to deliver a truly unique trade show theme and experience, and then a memorable give-away that reinforced the client’s brand.